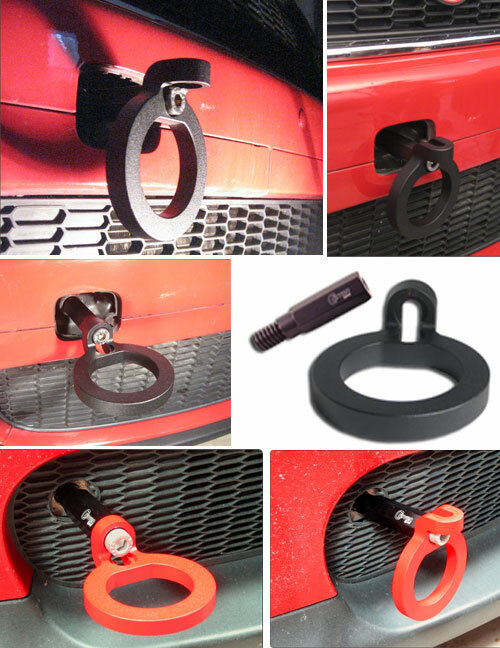 Presenting the Deluxe Tow Hook for MINI Cooper: one of the finest tow hooks on the market with a flip-flop feature that is super cool! With a simple turn of the allen bolt and a quick squeeze, this tow hook transforms as needed. Once it is bolted to the tow hook eye, the loop can be set to two positions. The hook will spend most of its time locked facing downward, just looking good and race ready. Then, on track day, loosen the fat M10 bolt a little and put the loop in the ready position for towing. This is a good-looking and tough unit. Machined from 6061 which makes it very strong. You can use it to tow your Mini, but not on the highway.